We had grand plans for a three-day yomp across the Cairngorms, but the best laid plans of mice and men gang aft agley. 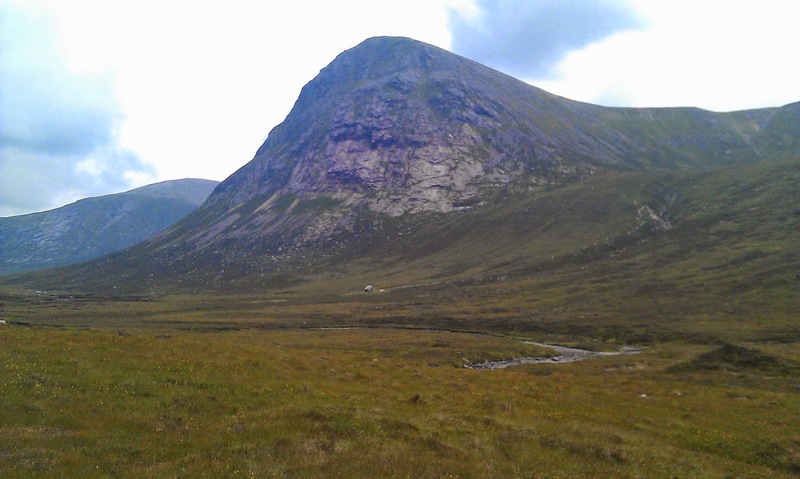 The idea was Blair Atholl to Aviemore, with a night in the tent followed by a night in corrour bothy, taking in up to 11 munros along the way. Forecast for thunderstorms on the first night made us switch it around, so we soon found ourselves on the bus from Aviemore to Cairngorm Mountain. After an erudite discussion as to the origin of the name 'Sugar Bowl car park' with the bus driver, we alighted and began our walk through the Chalamain gap and on to the Lairig Ghru in hot sunny weather. 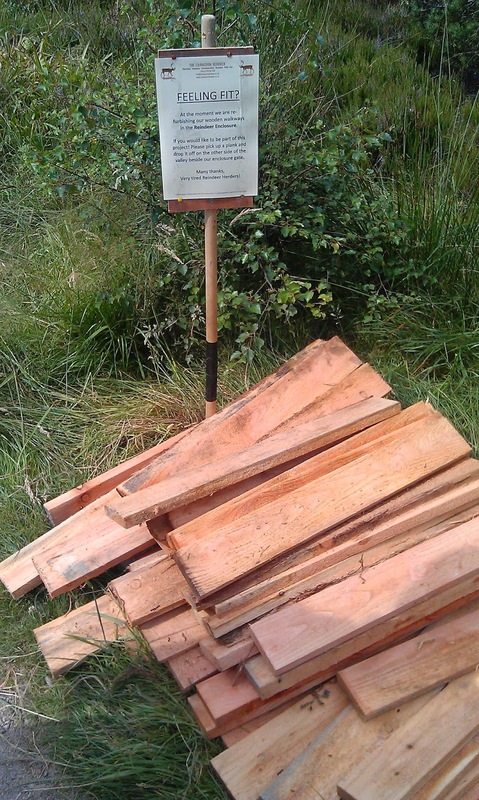 Along the way we helped some reindeer herders build some wooden platforms - all in a day's work. The going was good through the gap and into the deep glaciated valley of the Lairig Ghru. The cake was good too. We reached Corrour bothy around 4pm, from where we had hoped to nip up to Cairn Toul before dinner. There was time to do so, but when we were approaching Devil's Point there was thunder all around, so we decided it would be safest to leave the taller hills for the morning. There was indeed a heavy shower after we returned to the bothy. Ah yes, the bothy... that quite place of refuge, perhaps shared with one or two like-minded walkers. The people sleeping in the bothy were nice enough - a family of three taking their 12yr old to his first munro and a solitary walker on a munroing mission. The problem was the thirty or more campers outside the bothy who made a mess and turned the bothy into a fume-filled sauna with their cooking. They were well organised and meant well, but thirty people are bound to leave a footprint of some sort. Needless to say, we didn't sleep much. There were also a gazillion midgies.